Mountainfilm on Tour shares a selection of the films from the annual festival with audiences around the globe and offers Mountainfilm for Students, a free educational outreach initiative for K-12 schools at tour locations. Year-round and worldwide, the tour reaches over 40,000 people on five continents. 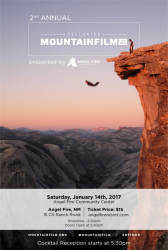 You can now preview the complete playlist for Telluride Mountainfilm on Tour presented by Angel Fire Resort! Join us for a Pre-Screening Cocktail Party at the Community Center at 5:30 p.m. The show begins promptly at 6:30 p.m. Mountainfilm will introduce the films and engage the audience in discussion following the films. Tickets will be available online or at the door.